We had family over for Mother’s Day, so I decided to smoke a turkey. 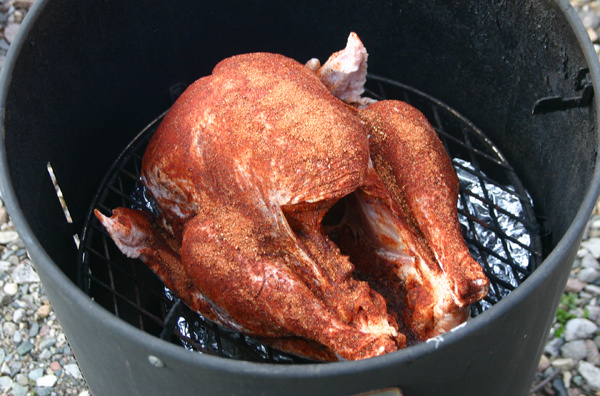 Turkeys are pretty cheap per pound, and smoked turkey is a real crowd pleaser. This recipe takes time though- it sure ain’t a candidate for the “Quick Meals” category. There are two ways you can smoke a turkey- the long way and the really long way. The really long way is to make a brine and steep the turkey in the brine overnight. Brining makes the turkey meat moist, juicy and delicious. If you choose to brine you’ll want to choose a turkey that has not been injected with a brine-like solution of turkey broth, salt, sugar and a few other ingredients. Check the label and make sure it’s nothing but turkey. Amish turkeys are typically unprocessed. If you want to skip the brining step, just go ahead and get a turkey injected with the brining solution. Why would you want to do the brining yourself if you can just pick up a pre-brined turkey? You can add seasonings to the brine you make yourself, and add your own signature extra flavor. This is the path to true barbeque mastery. If you’re doing the brining step, on the day before you’re going to grill, boil a 1/2 gallon of water with the rest of the ingredients in a large stock pot for 10 minutes or so. Let it cool to room temperature. This is important- don’t put the turkey into brine that is too warm. It’s important to keep the turkey at refrigerator temp. Rinse the turkey off well and if it’ll fit in the stock pot, put the turkey in there and add the other 1/2 gallon of heavily iced water. If the turkey is too big, any other clean container will do- 5 gallon bucket, large plastic bag, as long as you can fit it into the refrigerator. Let the turkey steep in the brine overnight. On turkey smoking day, get an early start because it will take at least a 1/2 hour per pound to cook the turkey through. Soak the wood chips or chunks you’re going to use for smoking for an hour before the turkey goes on the heat. I used a mix of apple and hickory wood. 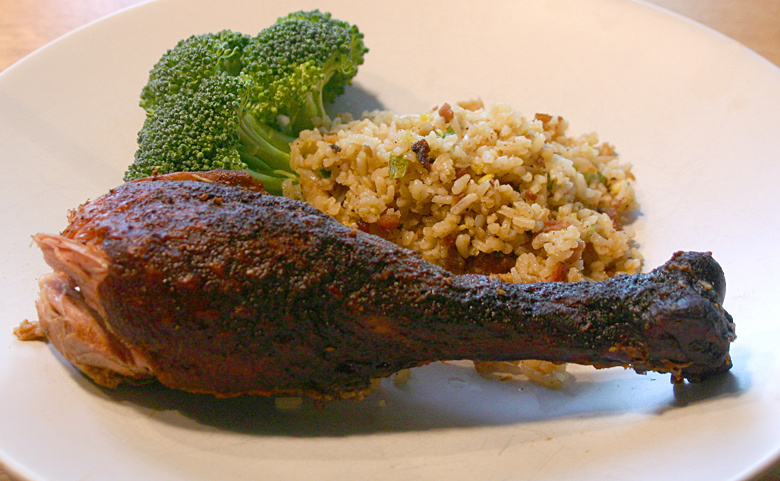 Remember, as I said in the Applewood Smoked Spice Rub Chicken post, you can use many different types of hardwood, but never pine or any evergreen wood. Fire up the charcoal, and while waiting for it to be ready, take the turkey out of the brine and dry it off with some paper towels. Mix the rub ingredients together and coat the turkey. Get in between the skin and the meat where you can- like in between the skin and the breast meat, there’s a pocket you can get the rub in there. Get the inside cavity of the turkey too. So this may come as a surprise, but in order to smoke a turkey, it really helps to have a smoker. You could use a regular charcoal grill, like a Weber kettle grill, as long as you keep the heat indirect and have a water pan under the turkey. But the hard part will be adding wood and fresh charcoal every 2 hours. 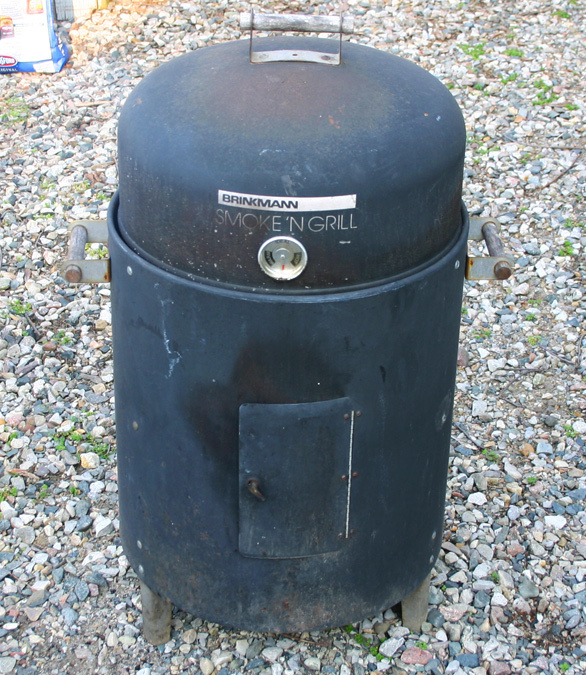 A smoker like the trusty old one I use in the picture has a little door at the bottom to add coals and more smoking wood. It doesn’t have to cost a lot- I picked this one up at a yard sale for $10- it had only been used once. It’s held up for several years now. 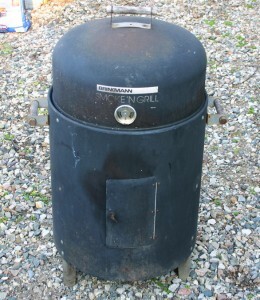 The middle of the smoker has a pan for water. This is important because it keeps the cooking temps cooler and the evaporating water adds humidity to the smoke, helping the meat to not dry out. You can also add apple juice or wine to the water pan. 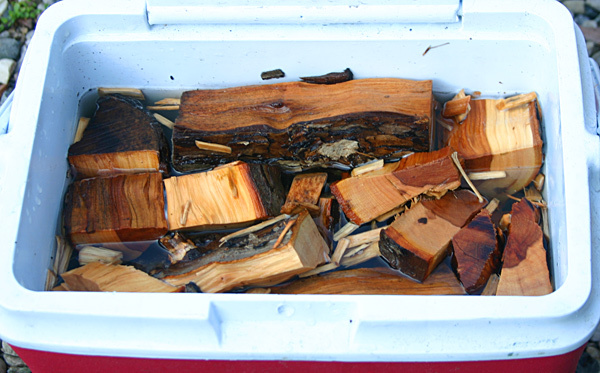 People also soak the smoking wood in wine to add flavor, but I’ve tried that in the past and I don’t think it really adds any noticeable flavor. I’d rather save the wine for drinking, so I just use water these days. Email and let me know if you disagree! Only 6 to 8 hours to go! So put the turkey in the smoker, insert the meat thermometer into the center of the breast, add wood chips or chunks, and settle in for a long wait. When you no longer see much smoke, add more wood. Keep an eye on the temperature reading on the smoker. you want to keep the cooking temp low and steady– if it spikes up it may be some of the smoking wood drying out and catching fire. I keep one of our kids’ squirt guns handy to put out the fire and bring the heat back down again. Add fresh charcoal every two hours and mix it in with the old charcoal. When the turkey internal temp reaches 165 remove, slice it up for your guests, grab yourself a turkey leg and enjoy!